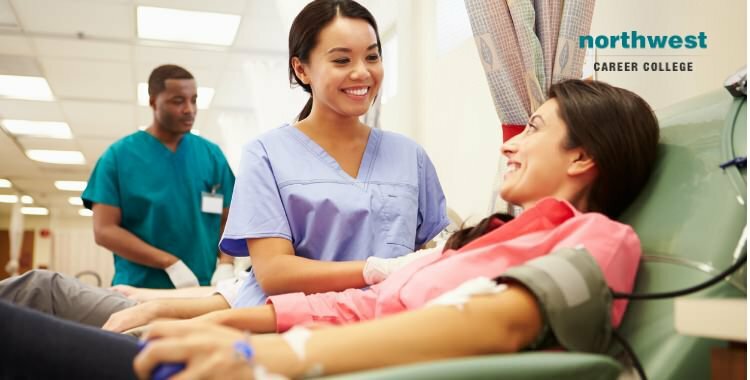 Phlebotomy is a great starting career for those who want to enter into a career in the medical field to become a nurse, electrocardiogram (EKG) technician, medical assistant, and more. One of the benefits of a role as a Phlebotomist is the number of options available when it comes to advancing your career. Generally, these options include taking up a management or supervisory position or becoming a donor phlebotomy technician. You can also study for a phlebotomy specialist certification to qualify as a collections phlebotomy specialist, registered phlebotomy specialist or patient service technician specialist. Getting your phlebotomy qualification generally takes around six months to a year. Here at Northwest, you can graduate in as little as three months, and our flexible schedule allows you to attend phlebotomy training, care for family and have a balanced life in Las Vegas while advancing towards your new career. During your phlebotomy training at Northwest, you will learn how to quickly draw blood while causing as little pain to the patient as possible. We will also typically prepare you to operate an EKG machine, collect urine samples, and identify heart disease as well as studying subjects such as venipuncture procedure, hematology, safety in health care, medical law and ethics, medical terminology. and the different types of lab tests you will be collecting blood for. After successfully completing your Phlebotomy Certification program in Las Vegas at Northwest Career College, you will receive a certificate which qualifies you to sit for the RPT exam administered by the American Medical Technologists (AMT). To be employed as a Phlebotomist, certification is required. The required certifications and degree programs for phlebotomists are widely varied from state to state, so it is essential to find a college, like Northwest, that is duly accredited. Phlebotomists in Nevada are required to have a Lab Assistant / Office Laboratory Assistant License through the Division of Public and Behavioral Health. Passing your RPT national exam (Registered Phlebotomy Technician) qualifies you for the license. Phlebotomists are in high-demand as many people who work in this field tend to gain more education or take promotions in the same area of study. Many medical facilities also offer reimbursement for education and training programs in phlebotomy to help keep student loan debt at a minimum. This combination of high demand and excellent training and advancement opportunities makes phlebotomy a superb starting point for students who have a passion in the medical field and want to advance in it. Employment for Phlebotomists with an RPT is expected to increase 25% from 2014-2024, faster than average for all occupations according to the United States Department of Labor. Earning prospects for an RPT are also high. On average, a Phlebotomist with an RPT earns $31,630 a year, with more than half of working Phlebotomists earning far more according to the Bureau of Labor Statistics. At Northwest Career College, we pride ourselves on providing one of the premier Phlebotomy Schools in Las Vegas. Our phlebotomy students have an 89% national exam pass rate and you can graduate in as little as three months. Our established and seasoned instructors will take you through every aspect of Phlebotomy and Northwest offers day, afternoon and night classes to accommodate your busy Las Vegas work and family schedule. Call us today at (702) 403-1592 to speak to one of our admissions specialists about your new Phlebotomy career. Previous Blog: Why Medical Billing and Coding is a Great Job for New ParentsNext Blog: Why Train as a Medical Assistant Now?